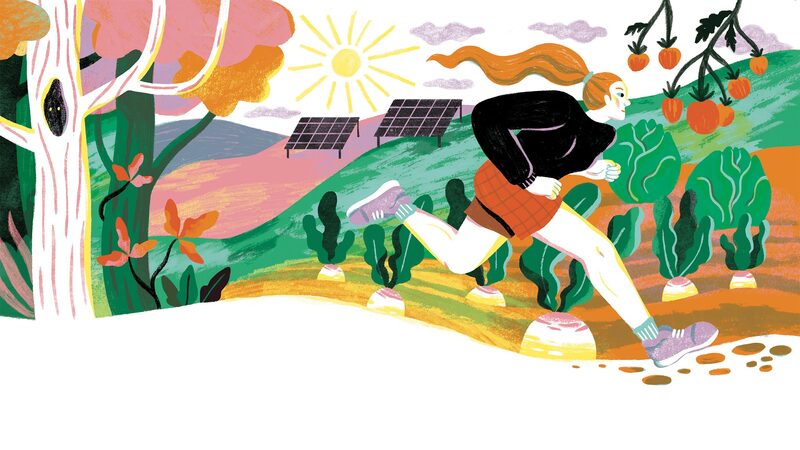 A chemistry professor and avid trail runner has some advice for those arriving on campus for the first time or after a long absence: lace up your running shoes and indulge in an immersive tour of the Middlebury environs. Here’s how. We’re going to start our run behind the Peterson Family Athletics Complex. Inside, the facility is home to just about every piece of exercise equipment imaginable, but let’s save the ellipticals and treadmills for the bone-rattling cold of deep winter and enjoy a run outdoors while we can. So out the back door of the athletics complex we go, heading southeast past the artificial turf of Kohn Field and veering into the woods that border a handful of Middlebury’s practice fields; there are usually a few soccer goals stashed here, so the trail entry should be easy to find. We’re hopping on the Trail Around Middlebury (TAM)—the 18-mile loop that encircles the town and, on this stretch, traces an arc around Middlebury’s Ralph Myhre Golf Course. The trail is well worn—our national-caliber cross-country team both trains and competes here—and can be challenging, but along this segment that we’re traversing, the route is relatively friendly to all types of runners. We’ll continue southward across the ridgeline onto a new section of trail that enables runners to stay well out of the range of errant tee shots flying around the back nine of the golf course, before emerging into the open, where we will be afforded spectacular views of Vermont’s Green Mountains to the east. A short run along the old golf course entrance road will bring us to Route 30. For those who have had enough, a downhill trot back to the athletic facilities completes a nice two-mile run. However, across the road, a more challenging stretch of trail awaits. Bidding farewell to some, the rest of us will pick up the TAM again on the other side of the road, entering a section of the trail known as the “Class of ’97 Trail,” which honors Colin O’Neil ’97.5, who passed away in a tragic car accident prior to his graduation. The narrow, rooted, and usually muddy descent from the ridgeline will challenge us to watch our footwork, but at least the area is not as hazardous as it was two summers ago, when a large—and protective—mama owl was prone to attacking passing runners, in my case drawing blood! (Such are the joys of true trail running.) After less than a mile in the woods, the trail emerges into an open field, where a left turn will lead to a long loop through acres of farm fields that make up some of the great views to the west of the campus. We’ll pass through where the “mods”—a cluster of small, prefab homes—once stood (razed recently after 20 years of “temporary” usage), angling northwest until we cross Route 125 and follow a short dirt road to the serenity of the College organic garden (now named the Knoll), one of my favorite places on campus. And then, the home stretch. We’ll continue along a dirt track as it snakes through the fields to the western edge of campus. Bicentennial Hall looms, as do a quintet of dorms— Hadley, Lang, Milliken, Kelly, LaForce—residence halls that are still referred to by some as the “new dorms” even though some have been around for nearly 50 years and there are far more recently constructed dorms on campus now. As we approach the road, we’ll jog through a field of large, standing solar panels, a relatively recent addition to the landscape; on sunny days, they look quite lovely, reflecting the blue sky. We’ll then cross Route 125 again, ascend a hill, and turn right, winding our way through the wooded environs of the Ridgeline Residence Complex. We’ll be tracking south again, slipping through the local graveyard and heading back toward the athletics complex. The cemetery holds many of the town’s fathers—Painter, Brainerd, Stewart, Munroe—as well as our final curiosity of the trail run: the gravestone of an Egyptian mummy buried in the otherwise Christian cemetery. Henry Sheldon, the original proprietor of the downtown Sheldon Museum, purchased the mummy of a very young Egyptian prince, but realized that it was not in good enough condition to put on display, and instead had it buried, with a very curious gravestone, after many years in storage. Finally, we’ll cross over Route 30, approaching the entrance to the athletics complex and coming to the end of a five-mile run—and the syllabus for Trail Running 101. Jeff Byers has taught chemistry at Middlebury for more than 30 years, a time when he has also traversed on foot the various trails that wind their way through Addison County. For the past nine years, he has authored the blog The Middlebury Trailrunner, which can be found at sites.middlebury.edu/trailrunner.